Atrovent Inhaler (Ipratropium Bromide) is used to provide management and control of symptoms in patients affected by asthma or COPD, (such as emphysema and bronchitis). It is a type of anticholinergic medicine which inhibits the action of acetylcholine, a neurotransmitter that is released in the lung. Atrovent Inhaler (Ipratropium Bromide) is used to provide management and control of symptoms in patients affected by asthma or COPD, (such as emphysema and bronchitis). It is a type of anticholinergic medicine which inhibits the action of acetylcholine, a neurotransmitter that is released in the lung. This is achieved by means of blocking the muscarinic receptors on the smooth muscle of the lungs. As a result of this, the reflexes in the lung which cause the airways to become tight (a factor which contributes to breathing difficulties) are stopped. The muscles present in the airways then become relaxed and open up, making it easier for patients affected by the conditions mentioned here to breathe. However, the medicine will not change mucociliary apparatus. Patients are told to use this medicine as a maintenance treatment, so as to prevent such symptoms as breathlessness, coughing and wheezing. It will not work rapidly like other short acting beta 2 agonists, as it takes roughly 30 to 60 minutes to reach its peak effect. Its benefits normally last for 3 to 6 hours. 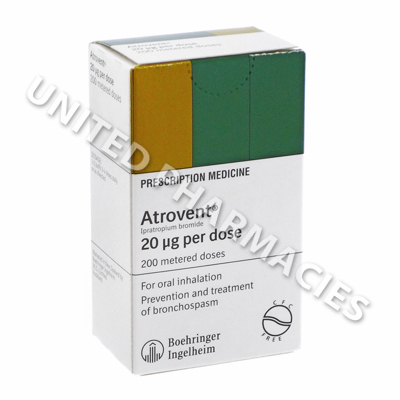 Atrovent Inhaler (Ipratropium Bromide) is intended for oral inhalation. There is enough medicine provided for 200 metered doses, and each dose contains 20mcg of medicine. Advice and instructions related to the correct administration and use of the inhaler will be given by your doctor before starting treatment. Prior to the first use, it will be necessary to prime the inhaler. This can be done by delivering 2 sprays into the air (make sure that the device is not pointing towards the face or eyes). Priming is also needed in cases where the inhaler has not been used for longer than 3 days. Doctors sometimes direct adult patients to administer a total of 2 inhalations 4 times per day. However, due to individual factors, this could vary for each patient and it is essential to follow the instructions given by the doctor. The doctor responsible for providing medical care should be informed of any side effects that occur. Some reactions are serious in nature. You must immediately seek medical care if you suffer from pain in the eyes, blurry eyesight, increased bronchospasms or any other serious side effects. Do not spray the medicine into the eyes. This could cause sore eyes, redness, mydriasis or other symptoms. Increased intra ocular pressure or a worsening of glaucoma (in patients affected by this condition) might also be possible. See your doctor immediately if any symptoms related to the eyes occur. As this medicine is an anticholinergic, urinary retention is possible. Patients affected by prostatic hyperplasia or other similar conditions related to urination will need to discuss this with their doctor before starting treatment. Always use Atrovent Inhaler (Ipratropium Bromide) as you have been prescribed by your doctor. Never self-medicate or change your dosage without first consulting your doctor. The correct dosage can vary depending on your health, medical history, and the severity of the condition being treated.